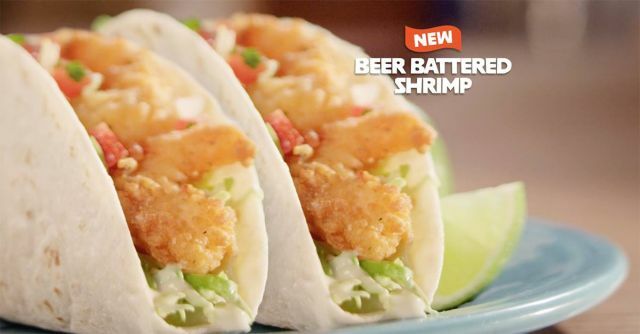 Del Taco adds new Beer Battered Shrimp to the menu to match their Beer Battered Fish this Lent season. The shrimp replaces their previous crispy shrimp offering and is featured in three new menu items along with new Del Fuego sauce, a creamy sauce made with cayenne and red pepper. - New Beer Battered Shrimp Taco - Crispy-fried beer-battered shrimp, cabbage, pico de gallo, and Del Taco's secret sauce, folded in a soft flour tortilla. It comes with a lime wedge. - New Del Fuego Shrimp Taco - Crispy-fried beer-battered shrimp, cabbage, pico de gallo, and new Del Fuego sauce, folded in a soft flour tortilla. A lime wedge comes on the side. - New Epic Surf & Turf Burrito - Ten Beer Battered Shrimp, 1.5 ounces of grilled carne asada steak, lime rice, cabbage, Del Fuego sauce and pico de gallo, wrapped in a large flour tortilla. - Beer Battered Fish Taco - hand-cut, beer-battered Alaskan Pollock filet, cabbage, Del Taco's secret sauce, and pico de gallo, wrapped in two corn tortillas and served with a fresh-cut lime wedge. For a limited time, you can get two Beer Battered Shrimp Tacos or two Del Fuego Shrimp Tacos for $4.50. The Beer Battered Fish Tacos are two for $4 (price and participation may vary). Also through February 14, 2016, you can get a free medium drink with the purchase of any Epic Burrito, including the new Epic Surf & Turf Burrito.